Research In Motion needed a miracle. It needed a fresh-faced BlackBerry and an operating system that made people say "whoa." Yet when it took the stage to unveil the BlackBerry Torch and the BlackBerry 6 operating system, one thing became clear: These were not heaven sent. This could very well mean the end for the BlackBerry. If you've been paying attention to RIM lately, you'll know two things: 1) That it sells more smart phones than anyone else in the United States, and is second only to Nokia worldwide. And, 2) it is experiencing slowed momentum and increasing consumer indifference in the face of dazzling competition. In short, RIM's in a mid-life crisis. The BlackBerry's saving grace used to be its physical keyboard, something no iPhone would be caught dead with. But now that Google's Android platform has taken off, it provides plenty of options that meet that simple requirement. And while businesses still buy BlackBerrys by the truckload, they don't always buy premium models, and they don't upgrade them every year. BlackBerry devotees the world over may be excited by the Torch and BB6 news. There are plenty of improvements over the older BlackBerry models, and RIM is promising to roll out the new OS as an upgrade for many popular models. Although appealing to the tens of millions of content BlackBerry owners is important, RIM's announcement Tuesday needed to excite the legions of disgruntled BB owners who are currently exploring other options, and even catch the attention of people who have already stood in line for iPhones or Droids. Alas, it did not. Most flagship smart phones have a 1 GHz processor and a high-resolution screen, 480 x 800 pixels or greater. It's what you might call the price of doing business. BlackBerry's new flagship has a 624 MHz processor. Because of this, interface and software sluggishness was immediately observed by reviewers such as Laptop's Mark Spoonauer and Engadget's Nilay Patel at the New York launch event. To carry it back to the mid-life crisis metaphor, as other phonemakers - Motorola, Samsung, HTC - hid their insecurities in Corvette convertibles, RIM chose the Sebring. And the screen? At 360 x 480, it isn't even close to the baseline. Apple calls its 960 x 640 iPhone 4 screen Retina Display, since it has pixels so small the eye can't see them. The BlackBerry Torch's display has one third as many pixels in almost the same space. As All Things D's John Paczkowski said on Twitter, "They should call it Cataract Display." As for the slide-out keyboard, opinions varied. BlackBerry's trademark is a physical keyboard, and consumers have generally disdained the keyboard-less Storm line. Gizmodo's Matt Buchanan said it was "a marvel … exactly what you'd expect from a BlackBerry." Spoonauer wasn't so enthusiastic, saying it was "not that great," and a "toss-up" compared to the doomed Palm Pre Plus. RIM made fewer missteps in the software realm. Maybe I should say that more enthusiastically: Hey, guess what, the BlackBerry 6 software does some neat-o things!! Better? Sure, they are getting points for building a nicer-than-Android interface for managing alerts and multitasking functions, and yes, BB 6's social networking tool is quite possibly one of the best out there. RIM even showed off one breakthrough feature: the ability to manage and sync a PC's media library to the phone over Wi-Fi. Fancy stuff, to be sure. But with the exception of Wi-Fi sync - which is very likely to be leapfrogged by both Apple and Google in their next mobile OS releases - the bulk of this is just slick me-too-ware. It's also a cover up for RIM's lack of energized third-party app development. Apps increasingly fill in the gaps for the two darlings of the consumer smart phone stage, and customers like it. As John Timmer of Ars Technica wrote, "The new Torch suggests that RIM has come a long way towards competing in a market that's increasingly touch- and consumer-focused. Unfortunately, it will reach the market at a time when its major competitors have already solved some of the same problems and are now refining their touch-based interfaces." While it's certain that gadget pundits are quick to skewer new releases, RIM basically laid this one out on the sacrificial altar. Still, even a stronger product would have been met with savage scrutiny, because, according to industry data, RIM has no room for anything but a major hit. Yes, BlackBerry is the biggest-selling smart phone name in the U.S. and No. 2 worldwide, according to comScore, Gartner and others. Still, counted among the users are people who have been handed a phone by their employers, without so much as a choice of color. So while the overall install base is good, the movement - or lack thereof - is bad. From February to May of this year, before Apple launched its huge-selling iPhone 4, BlackBerry's monster market share dipped a little in the U.S., according to comScore , from 42.1 percent to 41.7 percent. Android shot up from 9 percent to 13 percent in that same time. (The iPhone share dropped from 25.4 percent to 24.4 percent, though sales were in a predictable lull on the eve of a major redesign that was not only expected, but leaked to the public.) My guess is that the next round of comScore numbers will show a drop in BlackBerry U.S. market share. Scarier still for RIM is Monday's report from Nielsen , which unambiguously stated that 57 percent of current U.S. BlackBerry owners were looking to jump ship. The largest group, 29 percent, wanted iPhones, while 21 percent were interested in Android. Even if it takes two or three years for everybody to get a new phone, that's a heck of a reversal in market share. It was with this in mind that we waited for today's news, and with this in mind that we dismiss it. "In world where every vendor is working to up their game, raise the bar and drive new innovation in hardware and software, it felt RIM barely met the bar much less moved it. According to RIM, this is the best Blackberry ever and I don't dispute that," wrote Michael Gartenberg, analyst and partner at the Altimeter Group, a research firm. "The questions is, will the Torch be bright enough to lure users away from the latest and greatest Android devices, iPhone 4 and a newly re-invigorated Microsoft Windows Phone 7? 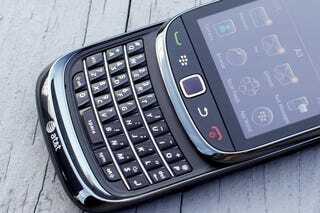 At the moment, if you're a die-hard BlackBerry user, there's a lot to love but in terms of the state of the art, RIM hasn't quite caught up to the leaders of the pack." The problem, for RIM at least, is that catch-up time might have already run out. Wilson, former Gizmodo features editor, is now the deputy Technology & Science editor at tech.msnbc.com. You can follow him on Twitter at @wjrothman.